We’d been in India for 6 years before venturing to drive. A vehicle is a potential guided missile so you have to learn evasive tactics before venturing out in your own missile in that country. There are two important things to master if you’re to make a successful driver, and these are the horn and accelerator. If you can master these two vital objects you’re assured safe travel. A truck air horn is preferable; probably still illegal for cars but certainly the people’s choice. It is helpful to learn at least the rudiments of Hindi too so you can swap pleasantries as you drive. Though translation into English may raise some eyebrows in the West I can assure you budhu (fool) ulu ka bacha (son of an owl) and like expressions are always delivered with good humor and waving hands as people pass on the roads. As we wanted to be accepted we were quick to learn these and other phrases so we could return pleasantries on our journeys. While there’s a regulation stating the left side of the road is the correct side to drive on in practicality you choose the side which moves you forward in the direction you need to go without impacting another vehicle. Our first driving experience there occurred when an expatriate friend returned to his homeland for a year and left his Ford Prefect 1952 model in our charge. The year was 1971. This vehicle must have had a bump or two in its time as it moved crab like as we drove. We soon learned to dodge and weave our way around shouting pleasantries in Hindi as we’d been faithfully taught to do. I found driving an exhilarating experience in spite of our unusual sideways lunge at the roads while driving the Prefect. By 1972 our friend had returned and we felt sufficiently orientated to buy a car for ourselves. We made the train trip to Bombay (now Mumbai) where we met an original “Honest John” car dealer down at the Fort area. Now a Bombay car of early 60s vintage would have all the rust spots welded together to keep its shape. Our new possession made it back over the Ghats (mountains) in the usual 6 hours for a 100 km journey. This was the era before today’s modern freeway was even considered. The car served us well for a couple of years until one day while traveling through Pune University campus the rust spots all came unglued and the bottom of the car ended up on the pavement to the intense delight of our children. We re-glued the Vanguard together and sold it. That Vanguard is probably still plodding though an Indian village and being patched up from time to time by roadside mechanics. I have genuine admiration for their skills. There are situations and places where it makes no sense to take a car, and having taken 7 years to work that out I finally did what others wiser had decided to do long before. I purchased a Lambretta scooter in 1972 to use around crowded streets of the old section of Pune city. 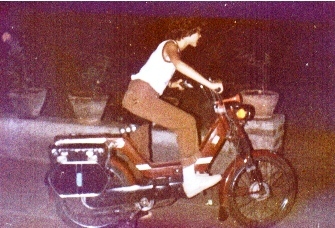 It was much cheaper to operate a scooter than a car for one person transportation, but a car was still necessary for long journeys and family comfort. The Lambretta scooter was heavy and could be unstable in wet conditions. I decided it would be well to teach Georgine to ride this beast but, the Lambretta of those times was unstable and we both ended up in a hedge laughing uncontrollably, with the Lambretta vainly trying to climb over us and take off by itself. Georgine refused to travel on that machine again. After the fiasco with the Vanguard we looked around for a suitable replacement and purchased a Fiat 1100. The Indian Fiat looked like a European 1960 model, and was manufactured under license. We gave it a complete motor and body makeover when we purchased it in 1974. On the way home from the body shop with its shiny new paint job I stopped at a red light and within minutes was surprised to see an auto rickshaw catapult over the top of the car and land on its side in front of a police chowk (station) nearby. The driver had been ogling girls and missed the red light. My brand new car was all beat up, but to my surprise the auto rickshaw driver when revived accused me of running into him. He didn’t own the rickshaw and was looking for an excuse to justify the destruction of that borrowed vehicle. Back to the workshop went the Fiat and we had to wait another month to enjoy our new car. The Fiat was a great car for its size. It pulled a trailer 1700 kilometers each year to our hill leave destination in South India for a month break from the blistering heat of summer. The roads were not like Western freeways in those days and were a challenge for a small car. For that reason in 1978 we purchased an old Plymouth. Well it was only a Plymouth 1955 model body shell after we finished messing with it. But the body was as strong as a tank, and with the help of an Indian mechanic friend we put a P6 diesel truck engine in this car. While it did have gears they were really not necessary after the installation of diesel power. The car ran on idle at 30 kmph and you had to constantly use the clutch in town to avoid nudging bullock carts. That motor was so powerful it didn’t need to change gears on any hill as I recall. I liked the katank of the diesel motor, and the sideways hula the car did to the beat of the engine. Now running it in was a bit of a problem. On delivery we had to push start it as the starter motor didn’t have the oomph to turn a reconditioned truck motor! We also learned to start it when it got bitchy by putting a lighted stick over the air intake and turning the motor over. A few drops of gas down the intake helped to wake the sleeping beast too. To finish the vehicle and give it a bit of class we installed truck air horns to warn villagers we were coming through. This was guaranteed to clear roads when activated. Out of all our cars I give this beast an A+. Having pensioned off the aging Lambretta it was time to upgrade. The replacement, a 1980 Vespa Scooter was swift, cheap to operate and quite stable on the roads at reasonable speed. However in 1981 I had a near miss on the road outside Pune University with villagers who had enjoyed too much happy juice and decided to dance in the middle of the road. I then decided it was too risky to argue with trucks which ruled the roads of India, or villagers who’d enjoyed too much arrack and would playfully leap in front of a speeding vehicle. With regrets the Vespa was sold. In 1980 a rich businessman fell in love with our Plymouth diesel car and began to pester us to sell it to him. By that time we‘d purchased seats from a luxury car wreck yard in Washington DC and the car looked rather spiffy. I named an exorbitant price which I trusted would turn off the pressure to buy, but to my surprise the businessman extracted cash from a pocket built into his dhoti (Indian traditional attire) and counted it out in front of me. I was temporarily rich! Documents were transferred and the businessman wrecked the car on his way home in an argument with a truck. We missed the two wheelers for quick short distance trips and purchased a 1979 model Luna Moped in 1981.This was primarily intended to get us round a large college campus quickly. 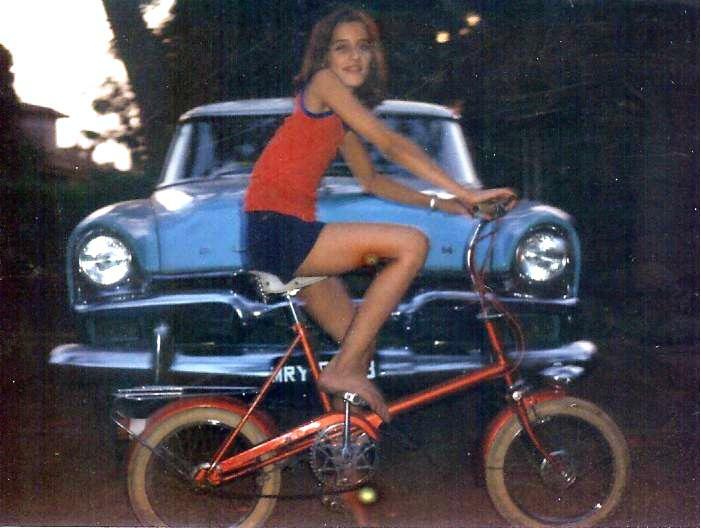 Well, that was the intention, but my two girls who were growing up fast noted their peers were riding Mopeds and decided we must have purchased the Luna for their exclusive use. At times I did get to use this Moped but suppose it was good our girls got experience on two wheelers and an occasional supervised try out on the car before they left us to continue their education overseas. Our next vehicle was a 1984 Premier Padmini car. This vehicle took its inspiration from the Italian Fiat range. It was a pretty car, and the last we owned in India before we sold up and headed for our new posting in Singapore 1985. Ah, the Am-bas-dar gari! How many times have I shared a ride in one of those with so many people piled in that you could hardly breathe. I used to pay extra to have a window seat! As for the hidden pocket, I used to travel and keep my cash in a plastic bag tucked down in the protection of my unmentionables. There is a good reason. In the case of the Indian businessman; it doesn’t catch attention like a briefcase would do, and then there’s the practical aspect of keeping it either in that hidden pocket or buried in the ground rather than have it in the bank where the tax man takes an occasional peep. lol. Jai Hind!! Oh, the adventures you’ve had, Ian. The vehicles you’ve driven in all the places you’ve been. How many languages are you functional in? Unfortunately English at the present time. My Indian language is quite rusty from non use and I hopped from place to place in East Asia continuously so there was no point in learning a language there. Ah. But you would understand a phrase here and there from different lgs? Yes a phrase from here and there would describe it. lol. It’s always interesting to find words in a language that obviously have their roots in another totally unrelated language too. Thanks for visiting my page in spite of the trauma you’ve suffered. Under the circumstances you have made some wise decisions and we are on your side as you move ahead. Loved this sweet Ian! You kept me laughing as I read. Had I been there I think I would have not ever gotten in a car to ride or drive. Did they have places to ride two wheelers other than with the car traffic? Sounds like a pretty dangerous place to drive anything. Hugs and Happy Father’s Day! Oh, my!! To say the least. What an adventure just to drive there. You descriptions Ian had my laughing. I am not at all certain I would have braved driving, ever. Well maybe with a tank. Our stay there was a bag of laughs and we enjoyed it immensely. I think you would have warmed to the thrill of the driving. wow – I suppose driving is something one gets into the moment on, a bit like being part of a tidal wave. Thanks again for sharing this different place. You need to see the trucks on the Pakistani side. They not only rival the Indian decorated trucks but have a mini mosque on the top for good measure! I’m sure you were mystified by the HORN OK PLEASE and other interesting art work on the back of each truck as you plied the roads in 2010. Now if you really want to have a thrill try the divided highway into Manila Philippines. When it gets traffic jammed on the way in they use the other side of the highway to proceed to Manila until everything is hopelessly tangled. As I read, I chuckled down the length of this post. Of course your choice of deft phrases helped immensely. I never drove in India – but perhaps, if I’d lived there – I might have bought a tank or at least, a bulldozer! You deserve a medal for courage, Ian —- and a larger medal for insanity LOL! — and I say this in the same manner your Indian fellow travellers exchanged pleasantries.